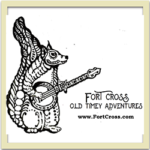 Family Owned and operated living history company specializing in hands-on activities, with an emphasis on music, art, and education. Also, birthday parties and private events! Pan for real gold, sluice & screen gemstones and fossils, visit the farm animals, shop the company store, see antique mining equipment, bottle house and small railroad, throw tomahawks and more. 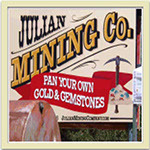 For hours please see Julian Mining Co. 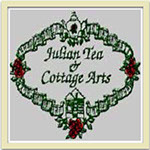 Tea is served daily in a charming turn-of-the-century home. Afternoon Tea consists of finger sandwiches, scone with whipped cream, homemade jam and dessert. The Studio Gallery Open from 10 to 4 Thu-Sun, but if we happen to be working weaving custom saddle blankets you are welcome to come in and see. 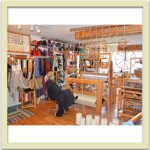 Handwoven Wearable Art including shawls, scarves, hats, skirts, dresses. Jackets. Many household items rugs, runners, lap throws, throw pillows etc. Most items are woven on site so it is a great place to experience this ancient art form in process.Some yarns are available for sale. 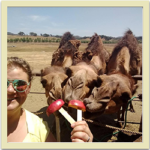 PRODUCTS: Hand-crafted camel milk soap, lotions and camel milk chocolate. 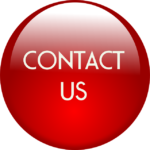 VISIT: Tours, camel rides and events. Located between Ramona and Julian on Highway 78. 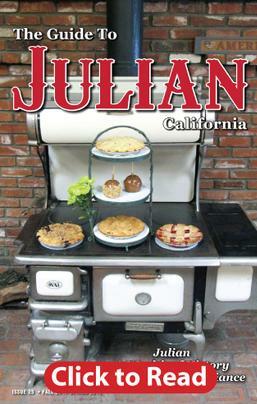 Join us in celebrating Julian Apple Days with the Old Time Melodrama. Performances are on the weekends in the month of October in the Julian Town Hall, come cheer the hero and boo the villain. All proceeds benefit our community scholarships. As Southern California’s Premier Sailplane destination, Sky Sailing offers rides of one or two passengers, instruction in the art of Soaring, and a place for the Glider community to meet and practice their sport. Soaring is the flight of a sailplane or glider, by using the energy produced by gliding along on the air-currents, much like a powered airplane. Learning to soar in a sailplane is the best way to begin to learn to fly. Pick up a free map at Town Hall and follow the self-guided History Walk to explore the historic buildings and markers throughout town. Return the filled-out questionnaire for a chance to win. Drive up C Street for a guided tour that takes you deep inside a real gold mine. Visit Main Street and sit at an authentic 1939 soda fountain for tasty ice cream treats. Drive down Highway 79 to Lake Cuyamaca for fishing, boating and hiking. 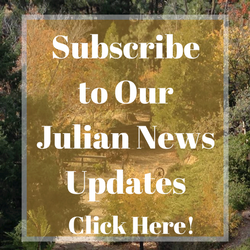 Be sure to visit the remains of Stonewall Mine, Julian’s largest past gold producer. Have a slice of apple pie and try one or more of the many other varieties of pies. Visit Julian’s Pioneer Museum to learn more about Julian’s past and see the Grosskopf House, a model of pioneer living. Browse through our one-of-a-kind boutiques, art galleries and antique shops in Julian and nearby Wynola. Taste a variety of local wines, beer and hard cider. Take an old-fashioned carriage ride down Main Street. 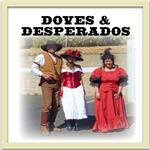 Enjoy a historic comedy skit from the Julian Doves & Desperadoes on Sundays. Learn how to pan for gold in Wynola. Pick up a hiking trail map at Town Hall for some scenic hikes at all skill levels. Take a guided trail ride and experience Julian on horseback. Make a reservation to visit the California Wolf Center to learn more about this endangered species. Take a drive down to the desert through Banner and explore Borrego Springs. 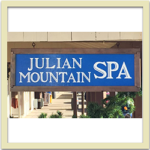 Dress up in old-fashioned Western clothing and have your picture taken at Julian Olde Time Photo. Pack a picnic lunch and visit one of our scenic parks including William Heise Park, Jess Martin Park and Cuyamaca Rancho State Park. 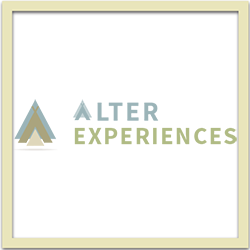 Visit our events page for a list of annual events, festivals, exhibitions, and much more. Make a future reservation at a quaint hotel or cozy B&B and return for a whole weekend! View the Julian sky through research telescopes at Observers Inn.